I was looking over Aldo shoes' website and found some. At first I thought, I'll be making a solo blog post about them but then an idea popped out my mind. Which is below. But wait, let me just say something about Aldo. I love their shoes very stylish and comfortable. Let me start with the shoes, since I did start at the bottom when compiling this. Those are Puller, Nehlsen and Durupan. All good-looking huh?! But I have dibs on the middle shoes. Want it badly. :D So, it's kind of hard to start styling at the bottom because usually, the bottom comes last aside from accessorizing. But good thing, my playful mind did not play hard on me. Here's the idea I got. The Country Club Man. As we all know, most people who are a club member wears the same but you can standout if you know how to suit yourself up with a proper attire. I chose Giordano Polo Shirt because it's cheaper than usual polo shirt and also a good quality. Giordano is a good brand, I must say. Then of course, pairing it with an off-white skinny pants will do it perfectly. That one is from Topman as usual. Now, this is the part where you will stand out. Tuck your polo shirt in your pants and wear a brown leather belt, found it at ThisNext. 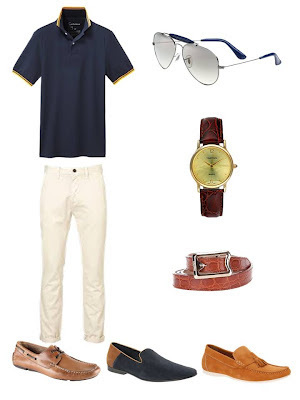 Then accessorize yourself with a brown leather gold plate watch from Timetech and lastly the perfect eyeglasses which undoubtedly Ray ban leather Clubmaster. Again, I have dibs on that ray ban. That's all. Till next time. Experience a board that's retro-fit to your personality and lifestyle. "Date Night Outfits should undergo preparation"
Go Green. Stop Global Warming.